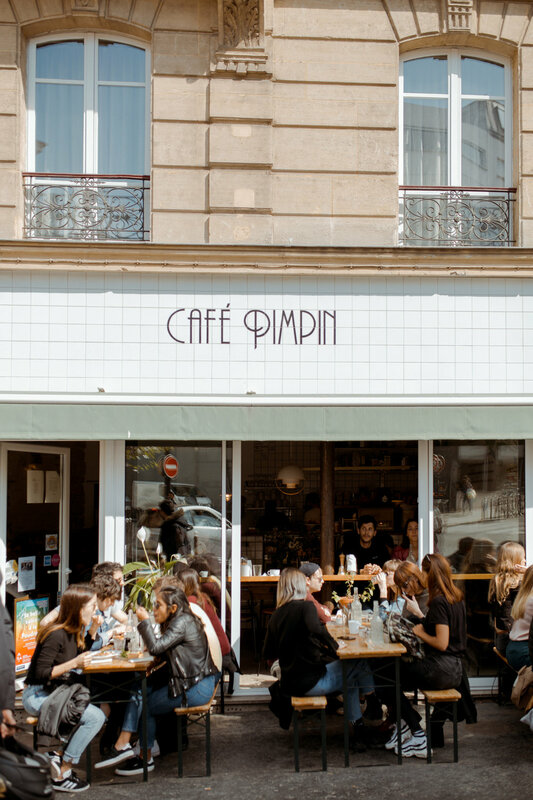 Our first stop of the day was Cafe Pimpin! Nick got a smoked salmon / dill / tzyiki toast, I got soft-scrambled eggs on toast & Maresa got eggs + soldiers. Real good. Coffee was solid as well! Really pretty, small space in a lively area. From there, we walked around town a bit, visited Montmartre & photographed some architecture. Eventually we made our way to Hotel De Sers! It’s in Champs-Elysées with a view of the Eiffel tower out the window & a claw-foot bathtub. (!) We had a couple balconies that were fun to hang out on each night & it was a great location for walking! Also, these heat-dry racks in every hotel in Paris are amazing. You can warm up towels for after a shower or dry your clothes & I think we need to take this concept back to the states. We stumbled upon a little sidewalk café & we had an Aperol Spritz. They’re so refreshing & I only found this out in the last few months. Consider this a formal PSA to try an Aperol Spritz. For the rest of the day, we window-shopped, grabbed coffee at Sylon (highly recommend), then tried & failed to get into several restaurants for dinner & eventually ended up at Big Love for pizza & pasta. Another very pleasant meal (& very mediocre photo of it, lol) — the pizzas were delicious & the pasta was house-made daily. Also an affordable wine list with good options! Loved the interior + exterior of this spot as well. For breakfast, we went to a spot that wasn’t our favorite so I’ll leave it out. After that, we visited the Shakespeare & Company bookstore, walked through nearby gardens at Square René-Viviani & meandered through neighborhoods & window-shopped a bit. We walked through a sweet area called Odéon at sunset & scouted a spot for dinner. We visited a bunch of Hemingway’s favorite spots as well (Closerie De Lilas, his apartment, his daily commute to the café to write at.) They were more fun to simply stop by & take a look at as the restaurants were typically not top-notch & were fairly expensive due to their claim to fame. Telescope was some of our favorite coffee on the trip. Nick’s espresso tonic was one of the best we’ve had. We went to Homer Lobster & each got lobster rolls. Amazing. My two favorite places in America for lobster rolls are New England Lobster in San Francisco & Mermaid Oyster Bar in New York (please go to either if you get the chance) & this one held up! Strada is another great coffee shop! Disclosure: This post may be sponsored or contain affiliate links that provide me with a small commission at no extra cost to you. All opinions are my own!